Chinese New Year is here again! It is the period of eating, eating and eating! 2 weeks ago, we had our Reunion Dinner session 1 with my aunt's family. Then there was another session with my own family, and another session with dear's family. On the second day of CNY, my family went out for a good lunch, almost bursting our stomachs. Straight after that, we travelled for about 30-40 minutes to my cousin's place, and ate like silly again. That was early dinner for me...and about 10pm, dear and I went out for supper...my favourite cheese and mushroom prata. Of all the CNY snacks, I usually have these few - kueh bangkit (MUST be melt in your mouth type), pineapple tarts (homemade from my aunt), peanut puffs (homemade from my other aunt). Kueh Bangkit and peanut puffs shall be my trial items next year. This year, I made peanut cookies and pineapple tarts. Up to the week of CNY, I had been making these 2 items for consecutive evenings. They never seemed enough. I had a list of people I want to give them to. It was over ambitious again, because my oven could not handle that much. As I baked, dear ate and ate. To his dismay, I had to tell him not to eat any, otherwise I would never be making enough...and he had to eat the "rejected" pineapple tarts, those which failed my QC and did not look nice enough to be put into jars to be given away. 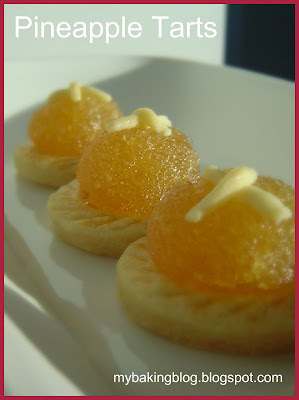 Since this is the first year I make pineapple tarts, I decided to use store-bought jam. I do not want to waste time cooking the jam and then end up with failing in making the crust. 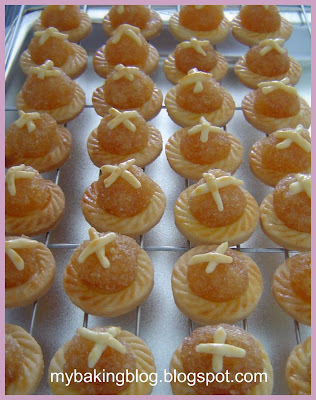 There are many many recipes out there for pineapple tarts. Some use milk powder (I do not quite like the smell of milk powder), some use cornflour, some use rubbing in method, some use creaming method...The first recipe I tried was too flaky. I then tried this second recipe which did not use milk powder or cornflour but turned out very good, so I am sticking to it till I find a better one. Now that I have found a good recipe for the crust, I can try making the jam next time. Wow Bimmer,what a delicious tart ? I would like to come over..ha ha..And reading what you wrote,its pretty clear that you are enjoying the season..